At least 7 people have been killed and twelve others injured after a packed commuter train hit a SUV at a level crossing north of New York City, officials say. The train, with about 800 passengers on board, hit the Jeep Cherokee near Valhalla – about 20 miles from New York – on February 3 in the evening. The SUV’s female driver was killed, along with six people on the train, New York Governor Andrew Cuomo said. The car and front carriage of the train caught fire following the crash. The packed commuter train had left Grand Central Station in New York City and was heading to Wassaic in south-east New York State. 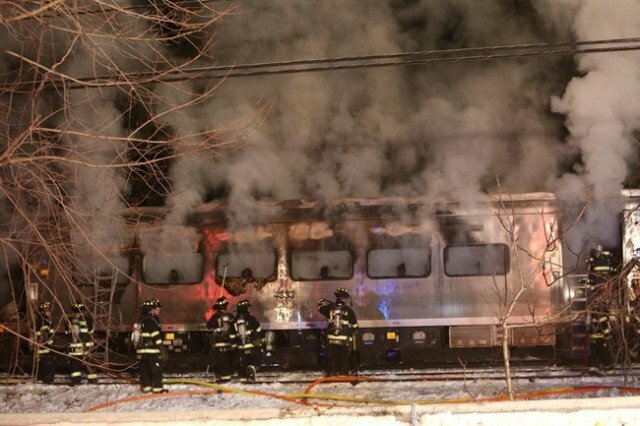 The crossing gates at the railroad had come down on top of the vehicle, which had stopped on the tracks, Metro-North Railroad spokesman Aaron Donovan said. The driver got out to look at the damage, and then got back into the car to drive forward before it was hit by the train. It pushed the vehicle more than 400ft. It is not yet clear why the vehicle stalled on the tracks. As a result of the collision the electrified third rail of the track came through the front carriage of the train. Passengers had to escape from the rear of the train. Andrew Cuomo, who visited the site of the crash, said he witnessed “a truly ugly and brutal sight”. Hundreds of passengers were taken to a local rock climbing gym following the crash. Parts of the railroad remain closed on February 4. Metro-North is the second-busiest railroad in the US after Long Island Rail Road, serving about 280,000 passengers a day in New York and Connecticut. It was formed in 1983 and serves about 280,000 riders a day in New York and Connecticut. Service on its Harlem Line was suspended between Pleasantville and North White Plains after the crash. Last year, the National Transportation Safety Board issued rulings on five accidents that occurred on the railroad in 2013 and 2014, criticizing Metro-North while also finding conditions had improved.